While I used to consume coffee religiously, I stopped recently because of the caffeine overload to my system. Typical symptoms included: jitters and trembles, an overactive mind, and a mid-afternoon crash. Don’t get me wrong I still love the drink—especially with coconut oil, cinnamon, and vanilla—but I’m sticking to my decision. Now, although nothing beats the taste and comfort of that morning pick-me-up, I opt for other warm beverages to get me through the day. A matcha powder latte is one of them. First, what is matcha powder? Matcha is essentially green tea. However, it is grown differently, is stone-ground, and then produced as a fine powder. The main difference is mainly in the way farmers grow the leaves. 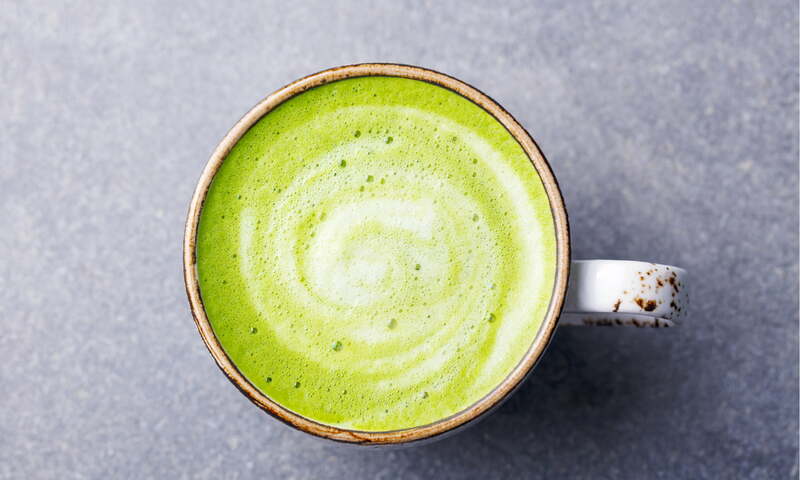 With matcha, the tea leaves are carefully shaded from the sun, which boosts the chlorophyll content in the leaves, which makes them extra-green and rich in antioxidants. This process also increases the caffeine content (in comparison to regular green tea). After that, the leaves are then laid flat to dry and slowly stone-ground. This results in a smooth, more caffeinated green tea powder. Low and behold, you have matcha. Matcha offers numerous health benefits, too. As mentioned before matcha is chock-full of antioxidants, but that’s not all. It also increases metabolism, detoxifies the body, enhances the immune system, and boosts energy. Caffeine wise, it contains a healthy 70mg of caffeine—much less than coffee’s 163mg—and interestingly enhances concentration while also calming the mind. The matcha caffeine high is also more gradual than coffee’s. This thankfully eliminates any mid-afternoon crashes. Basically, it’s good for you and gives you your caffeine fix (crash-free). A win-win situation! 5) Pour into a mug and enjoy! 2: As a face mask. Mix together to make a paste. Spread the paste over your face and neck, leave on for 10-15 minutes, and remove with a warm cloth. Voila! Blend ingredients together until smooth, then serve immediately and enjoy! These recipes are just a few examples of matcha’s versatility, but we can’t forget the traditional method: sifted and whisked into hot water (typically done with a bamboo whisk). This is a nice alternative to green tea– especially if you’d like a richer flavour. Either way though, no matter how you use it, matcha is a multi-purpose, nutrient-rich powerhouse and caffeinates me without the jitters. What’s not to love? Find matcha powder (we have a number of varieties) in most of our Blush Lane locations!